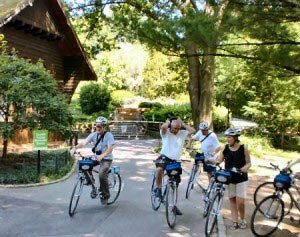 During one of these bike tours in New York you will be expertly guided through your choice of location. Explore Central Park, Brooklyn Bridge, the area along the Hudson River and many other sights. By bike, you’ll see much more than you would walking. So, even if you don’t have much time, it’s an ideal way to sightsee in New York. Book your bike tour online before you travel. This is cheaper than booking on the spot and you’re guaranteed a place on the tour. Would you rather explore the city on your own by bike? In that case you can rent a bike in New York. Eric’s Tip: Bike tours in New York aren’t cheap. It’s much cheaper to hire a bike alone. If, however, you’re in New York for the first time, an inexperienced cyclist or travelling with your kids: I would recommend you do take an organised bike tour. You’ll learn the ropes quickly and, most importantly, it’s safer. Which bike tour should I choose? Option 1: This tour through Central Park allows you access to all the sights that the park has to offer at a leisurely pace. The guide tells you everything about the park, its history and the iconic sights such as Strawberry Fields and Sheep Meadow. The tour takes two hours and is available all year around. Option 2: If you’re interested in exploring Harlem, this bike tour is the perfect option for you. In two hours you’ll see many of the neighbourhood’s highlights, like Strivers Row and the Malcolm X Mosque. On top of that you’ll have some nice views of famous New York buildings. Option 3: The Brooklyn Bridge bike tour, as you can guess from the name, takes you over the Brooklyn Bridge. In addition you’ll cycle on the beautiful bicycle path along the west-side of Manhattan. Allowing you to be able to see a lot of New York’s highlights. Be prepared to cycle over two long bridges. This is a 3 hour tour and available from April until October. Option 4: With the Electric Bike Tour you don’t cycle with regular bikes, but with pedal assist e-bikes. The tour goes through Central Park, Midtown Manhattan and the Upper West Side, passing by all kinds of famous landmarks without leaving you exhausted. The e-bike keeps you comfortable all the way! Option 5: This electric bike tour takes you along the Hudson River and through Central Park. It allows you to explore these areas in depth. Do bring your camera as there is a lot to see during this tour. You’ll cycle for about 4 hours. This tour is available from April until November.